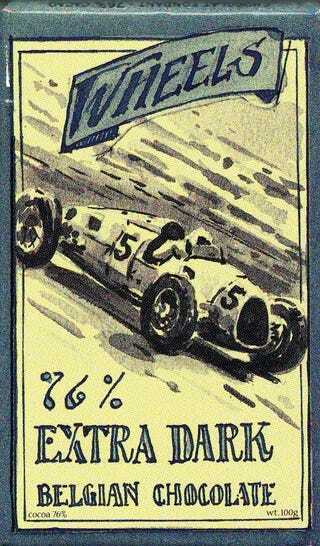 You can buy a bar of Belgian chocolate with Bernd Roseyemer’s Auto Union Type C on the wrapper. Just make sure you don’t exceed 270 MPH while eating it. The bar is manufactured by the peculiarly named Belgian chocolatier Starbrook Airlines and is part of their Classic Wheels range, all of which come in automotive themes. They are sold all over Europe in gourmet delis for around $5 a pop. Perhaps if you gobble down an entire bar of Rosemeyer in one go, you will be able to do what he did in 1936 at the Nürburgring. Where, in thick fog, he took his finicky mid-engined V16-powered Auto Union to first place in the Eifelrennen, overtaking Tazio Nuvolari on the last lap. My Rosemeyer bar has sat in my candy box ever since I acquired it. I don’t dare touch it. Who knows, maybe it makes you fling antediluvian racing cars around with reckless abandon. And while I've watched videos of Bernd Rosemeyer, studied in great detail Bernd Rosemeyer, admired Bernd Rosemeyer, I'm no Bernd Rosemeyer.